The microderbrasion machine provides a non-surgical skin refinish procedure, by using diamond peeling heads to abrade or rub off the top skin layer, then vacuuming out the particles along with any dirt and dead skin. This procedure removes skin debris, imperfections, blemishes, wrinkles and unwanted pigmentation on the skin. 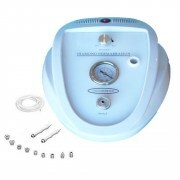 Microdermabration Unit. Diamond top (FREE).